While there is no “standard refrigerator”, there are some general trends you can look to for guidance as to which size and style of refrigerator is going to be right for your home. While there are often several refrigerators from different brands that occupy each size “space”, being off by a few tenths of an inch in width or height could mean there are no perfect matches for your kitchen layout. If you choose a more “standard” dimension though, you may have tens or even hundreds of compatible models to choose from. 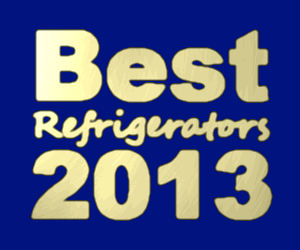 In our database are thousands of refrigerator dimensions we can look at to spot these sweet spots. Here we take a look at some of the more common dimensions, and which ones could severely limit your options. While the information here won’t guarantee that you find your dream fridge, it can help you to future proof your kitchen by choosing a layout that has lots of options to work with. What are Standard Depths of Refrigerators? Refrigerator manufacturers have their own standards for their models. While there are a lot of brands out there, many of them are just rebranding the same model as other brands, or making slight alterations to it. This helps to create more standard dimensions than if every brand were manufacturing their own refrigerators. 24 to 36 inches deep is the range that the vast majority of full sized refrigerators will fit into. Common refrigerator depths fall on even numbers of inches, but some manufacturers do have odd numbers. In any case, the nice round numbers that manufacturers claim as the depth of the fridge is not always the actual depth. They very rarely land right on those measurements. 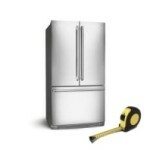 Also, be careful when dealing with refrigerator depths, as most refrigerators need some clearance in the back. The amount of room you need back there will vary based on what type of electrical and water hookups there are. A counter depth refrigerator is a freestanding fridge which has been designed to be installed with the door flush or near flush to the surrounding countertops and cabinets. This means they tend to be more shallow than “standard” refrigerators. Of course there is no true standard sized countertop or cabinet depth, and so there is no true standard counter depth refrigerator either. However we find that most counter depth refrigerators tend to be between 24 and 29 inches deep to the front panel of the door. 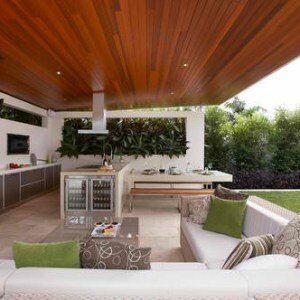 Usually the doors should be somewhat beyond the surrounding countertops to allow them to open properly, but some higher-end models have special hinges that allow them to essentially be built-in. These models generally are near the lower end of the depth range. Remember that for most freestanding refrigerators an extra 1 to 2 inches of clearance will be necessary in the back to allow for electrical and water hookups. This is just as true whether the door is meant to be flush with the cabinets or extended beyond it. The average depth of counter depth refrigerators in our database is 28.59 inches, 3 inches shallower than the 31.59 inch deep average for standard depth refrigerators. 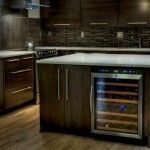 Built-in refrigerators are becoming more and more common. While an integrated fridge is going to be rather pricey, built-in models tend to have high quality components and a look that freestanding refrigerators just can’t match. When looking at the depth of built-in models, a standard becomes clear. As these refrigerators are designed to fit in flush with cabinets, they have to be rather shallow in most cases. Even more shallow than counter-depth refrigerators most of the time. 24 to 27 inches deep is the norm. 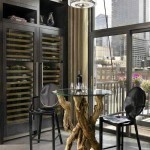 Other depths for built-in refrigerators are few and far between. Usually the installation depth will be about 25-28 inches deep to allow for necessary clearance for the connections in the back. The average depth of built-in refrigerators is 24.94 inches deep. What are Standard Widths of Refrigerators? While refrigerator depths can vary quite a bit, they have nothing on widths in regard to the extent of that possible variation. Refrigerators can range from 18 inches wide all the way up to 64 inches across. However, widths of refrigerators in general are much more standardized than the depth measurements are. This is because usually it’s the most important dimension in regards to whether a refrigerator will fit in it’s installation or not. The necessity to standardize widths leads to the majority of refrigerators fitting into a narrow range. 32 to 48 inches is where you will find most refrigerators, and 32 to 36 is really where most of the action is. Again though, some clearance is necessary for the doors to open properly on most freestanding, and even some built-in models. While this tends to be just a small fraction of an inch, in cases where the refrigerator will be installed with a hinge side up against an extended wall it can require several inches, up to a couple feet, of clearance! So if you are installing a refrigerator next to an extended wall, you will want to be especially careful in checking dimensions. Counter depth refrigerators tend to make up the capacity they lose in depth by adding to the width. 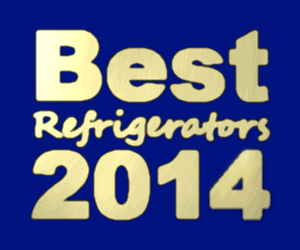 This trend becomes clear when looking at the average depth of the two types of refrigerators. The average counter depth refrigerator width in our database is 35.02 inches wide, compared to 32.69 inches wide for standard depth refrigerators. You’ll find a lot of 36 inch wide counter depth refrigerators, and even some wider ones. 32, 42, and 48 inch wide refrigerators are also available in the counter-depth category. Built-In refrigerators are often even more shallow than counter-depth models, and so widen themselves even more. Also they tend to be much taller than freestanding refrigerators. Built-in refrigerators have very standardized widths, since it is so important to get the refrigerator to fit in a very exacting space. 32 inches wide is somewhat common, because many of these “small” built-in refrigerators are all refrigerator, meaning the freezer will be seperate. Most of the time built-in refrigerators of this type are meant to be paired with a matching 32 inch wide all-freezer model. Essentially making for a 64 inch wide side by side! The larger built-in models tend to have the fresh food and freezer compartments together. These built in refrigerators can most commonly be found in 36 inch widths, with 42 inches and 48 inches being well represented as well. The average width of built-in refrigerators ends up being 41.03 inches. 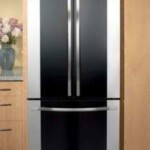 What are Standard Heights of Refrigerators? 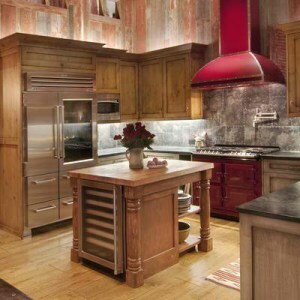 Height is the one dimensions where counter-depth and standard refrigerators tend to be much the same. You will find more short standard depth refrigerator models, but in general 68 to 72 inches tall is standard for a modern full sized refrigerator. Standard depth refrigerators come in at 68.46 inches average height, while the average counter-depth refrigerator is 69.42 inches tall. That 1 inch difference in average height has more to do with counter depth refrigerators being higher end models than anything inherent to the depth of the refrigerator. When comparing similar capacity and/or price the gap narrows. Much like with depth, built-built in refrigerators tend to only come in one flavor. 84 inches tall is the standard, and it’s hard to find models that are significantly different in this dimension. The average works out to 83.38 inches, which once you take into account leveling legs and installation clearances is just about right on 84 inches. The extra height of built-in refrigerators is usually necessary for airflow and due to the compressor being mounted on the top behind an ample sized grill. The few built-in refrigerator models which aren’t close to 84 inches tall tend to fall into the same 68 to 72 inch range as the “standard” set by standard and counter-depth models. What are Standard Capacities of Refrigerators? The capacity of a refrigerator is where the most variation occurs. This is expected since teh capacity of the refrigerator not only varies based on the product of height, width, and depth, but also by the type and amount of insulation and features. An ice maker or lots of drawers can impact the amount of space inside the refrigerator. Also, as capacity isn’t generally a sticking point, manufacturers don’t feel pressed to hit any specific numbers. The range for refrigerator capacity is immense, and the averages don’t tell us much at all. It’s a bad metric to look at when choosing a refrigerator anyways. In general, you want to look for a refrigerator that’s going to fit your kitchen in regards to dimensions, necessary features, and style rather than worrying about if there’s a few tenths more or less capacity fitting in that space. 2 Responses to What is a Standard Sized Refrigerator? I need a 66 inch refrigerator to fit under a cabinet. I can not change the cabinet and the fridge can not go any where else. But I want a bottom freezer, an ice dispenser( crushed and cubed) in the door. Of course I would love a French door fridge but I seem to be out of luck.